There are 21 people total in our bridal party (9 groomsmen, 2 maids of honor, 7 bridesmaids, 1 bridesman, a flower girl, and a ring bearer) and rather than list all of them I figured I would just include my attire ideas. One thing that I did not want is the girls to be wearing some old school ugly, traditional, long, heavy gown. My wedding is going to be on a summer evening in Sacramento, I don't want them to be sweating or hating me because they are walking down the aisle in a hideous heavy dress, and being photographed no less. After my first trip out with the majority of the girls, we found the one. It is a design by Bill Levkoff. It looks amazing on all the girls...and they love it! The boys are getting their attire from Tuxedo Den. We haven't yet picked out the specific tux, but will do so when the Bridesmaids dresses are finalized. 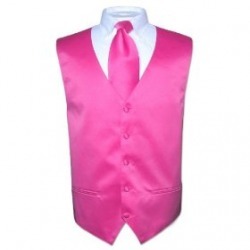 The goal is to have the groomsmen and bridesmaids be in pink with yellow boutonieres/bouquets. Who knows what my mom will wear. She claims she is going to wear the dress on the left. Luckily my older brother is getting married 7 months before me, that way she can try her crazy ideas out on them first. LOL. So I started gathering my bridal party gifts early when I saw certain ideas online or when sales went on. I am a fairly "crafty" person so one of the gifts will be DIY. -Shadow boxes (5x7) that I am going to decorate to each individual's taste and include a picture. It will mostlikely be from the bachelorette party or the shower. -Tote bags. There are 2. 1 is a larger bag that they can use for traveling and the other is a smaller bag that is the perfect size for makeup and toiletries. -Makeup tools holders with a nail filer and VS lip gloss. -VS soap and a loofah with bath salts (DIY)- for bridal shower gift. -I am thinking about getting a small ($20) gift certificate for each of them as well. We all love a sushi eatery by our house or Starbucks or Express, so I'll probably get them from there. My mom will have a field day picking this out. Growing up, she always loved putting me into fru-fru dresses, so this is her opportunity to relive those moments again. I am thinking something cute and simple, but who knows, what the final verdict will be.